Abstract. Here we present Antarctic snow accumulation variability at the regional scale over the past 1000 years. A total of 79 ice core snow accumulation records were gathered and assigned to seven geographical regions, separating the high-accumulation coastal zones below 2000 m of elevation from the dry central Antarctic Plateau. The regional composites of annual snow accumulation were evaluated against modelled surface mass balance (SMB) from RACMO2.3p2 and precipitation from ERA-Interim reanalysis. With the exception of the Weddell Sea coast, the low-elevation composites capture the regional precipitation and SMB variability as defined by the models. The central Antarctic sites lack coherency and either do not represent regional precipitation or indicate the model inability to capture relevant precipitation processes in the cold, dry central plateau. Our results show that SMB for the total Antarctic Ice Sheet (including ice shelves) has increased at a rate of 7 ± 0.13 Gt decade−1 since 1800 AD, representing a net reduction in sea level of ∼ 0.02 mm decade−1 since 1800 and ∼ 0.04 mm decade−1 since 1900 AD. The largest contribution is from the Antarctic Peninsula (∼ 75 %) where the annual average SMB during the most recent decade (2001–2010) is 123 ± 44 Gt yr−1 higher than the annual average during the first decade of the 19th century. Only four ice core records cover the full 1000 years, and they suggest a decrease in snow accumulation during this period. However, our study emphasizes the importance of low-elevation coastal zones, which have been under-represented in previous investigations of temporal snow accumulation. How to cite: Thomas, E. R., van Wessem, J. M., Roberts, J., Isaksson, E., Schlosser, E., Fudge, T. J., Vallelonga, P., Medley, B., Lenaerts, J., Bertler, N., van den Broeke, M. R., Dixon, D. A., Frezzotti, M., Stenni, B., Curran, M., and Ekaykin, A. 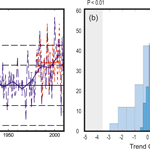 A.: Regional Antarctic snow accumulation over the past 1000 years, Clim. Past, 13, 1491-1513, https://doi.org/10.5194/cp-13-1491-2017, 2017. Regional Antarctic snow accumulation derived from 79 ice core records is evaluated as part of the PAGES Antarctica 2k working group. Our results show that surface mass balance for the total Antarctic ice sheet has increased at a rate of 7 ± 0.13 Gt dec-1 since 1800 AD, representing a net reduction in sea level of ~ 0.02 mm dec-1 since 1800 and ~ 0.04 mm dec-1 since 1900 AD. The largest contribution is from the Antarctic Peninsula.